Northampton’s 1891 Academy of Music was the exceedingly appropriate venue for the world première last Friday evening of the opera The Garden of Martyrs by Amherst College professor of music Eric Sawyer with libretto by UMass-Amherst professor of theater Harley Erdman. The central events of its story took place here in 1806, 30 years after the Declaration of Independence and just 17 after establishment of our national government by the ratification of the Constitution. Both of those documents/events are mentioned to establish the context for the trial, guilty verdict, and hanging of two traveling Irish Catholic laborers from Boston: Dominic Daley, sung by tenor Alan Schneider, and James Halligan, sung by baritone Keith Phares, who were (falsely, it is now believed,) accused of opportunistically murdering Marcus Lyon of Wilbraham. That death occurred 15 years after ratification of the Bill of Rights, enshrining in law the freedom of exercise of religion. The opera is based on the historical novel of the same title by Fairfield Connecticut author Michael C. White, director of the creative writing program at Fairfield University. White took the limited information about the episode and created plausible personalities for the figures and a limited number of additional characters, real and invented, to flesh out their biographies. Erdman and Sawyer worked closely to turn the novel into a focused and effective operatic tale. The nearly full 800-seat house was welcomed Amherst’s State Representative Ellen Story. The opera opens not with an overture but rather with a choral number delivered by the 30-member chorus representing the citizens of and visitors to the city, who numbered 15,000 according to the records. They mulled and mumbled over rumors of disruption of the imminent hanging by “papists” coming out from Boston. The focus shifts immediately thence, to the home of Father Jean Louis de Cheverus, the central character, sung by tenor William Hite, UMass-Amherst senior lecturer in voice. An immigrant from France, who fled the Reign of Terror (in which priests were rounded up and summarily executed, about which he is conflicted, as we learn in a later scene), de Cheverus later became the first Roman Catholic bishop of Boston. His quiet evening is interrupted by the loud knocking on his door by Finola Daley, Dominic’s wife, an invented character sung by soprano Amy Johnson, formerly of the UMass Amherst voice faculty and now assistant professor of voice and co-director of the Undergraduate Opera Workshop at University of Cincinnati Conservatory. She comes to implore him to travel to Northampton to hear the final confessions of and offer absolution to the condemned men, whom she is convinced are innocent, and to preach the funeral oration, normally assigned to a Protestant clergyman by the State Attorney General—a tradition deriving from Puritan times. The rest of the first act deals with the negotiations between Cheverus and Attorney General James Sullivan (the irony of his Irish name does not go unnoticed), sung by bass (also stage director) Vernon Hartman, to allow Cheverus to deliver the oration. Sullivan’s appeal to Governor Caleb Strong to grant this is denied. The act concludes with Cheverus’s decision, in reflection and prayer, to defy the refusal and travel with Finola and the couple’s infant son Michael to Northampton. 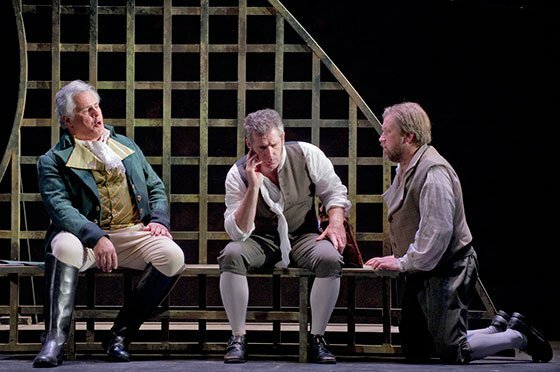 Act 2 opens in the Northampton jail cell where the contrasting personalities of the two Irishmen are disclosed: Daley is devout and a loving family man, Halligan a nonbelieving rake. The scene then shifts to the center of town, where the Boston coach arrives to discharge Cheverus (dressed in civilian clothes to avoid calling attention to himself), Finola and Michael, and to their search for lodging. The Widow Clark, sung by mezzo Marjorie Melnick, member of the UMass-Amherst voice faculty, reveals that rumors abound concerning the innocence of the condemned, and takes in Finola and Michael. She offers a flask of whiskey to Cheverus and he heads into the Meadows, where he gets drunk; a scuffle with some soldiers ensues in which a shot is fired. Act 3 begins as the turnkey reintroduces him into the jail cell, where confessions and absolution occur, with Dominic Daley going first. Sullivan arrives to chide Cheverus for his contempt of the orders not to come to Northampton. Finola appears, charging Sullivan with suppression of evidence; he promises to seek a stay of execution. Between Sullivan’s departure on this errand and return with the news of Strong’s denial, Cheverus gains Halligan’s confidence by revealing his own past and conflict, inspiring Halligan to accept absolution. At the base of the gallows, Sullivan, remorseful, allows Cheverus to preach the oration, and the action moves inexorably to the fateful end, which the accused accept stoically. One of the striking features of the work is the libretto. It is tight, smooth, unaffected modern speech, much of it prose but in several instances rhyming verse with virtually no artificiality. Only occasionally does it seek verisimilitude, with the dialogue of the two Irishmen incorporating some accent, colloquialisms, and terminology, and that of Cheverus and his servant Yvette (an immigrant from Guadeloupe, sung by mezzo Chrystal E. Williams) including some authentic French. The language speaks directly to the audience. The story builds steadily to the execution. The production included supertitles, although the singers’ excellent enunciation throughout rendered them superfluous. Sawyer’s music can be characterized as modern tonal, and follows the libretto , smoothly, rising and falling appropriately and subtly drawing us into the story. At the outset, confronted with a mob, we feel like observers, but we become more involved and attached to the characters such that by the end we feel we are a part of the mob listening to Cheverus’s funeral oration. We understand the messages of forgiveness and redemption and of the danger of catastrophic events resulting from rushed actions and hidden agendas, and parallels with present events. The versatile sets designed by Smith College professor Ed Check featured drops, lowered and raised in rapid action, that bore framed shapes, suggesting angel wings or stained-glass windows, that were covered with translucent fabrics that allowed characters on a platform behind and above to be seen backlit, creating a veil-like separation for flashbacks. The historical testimony of the 13-year-old witness Laertes Fuller, sung by mezzo Dorie Goldman, was also presented twice from this higher perspective. 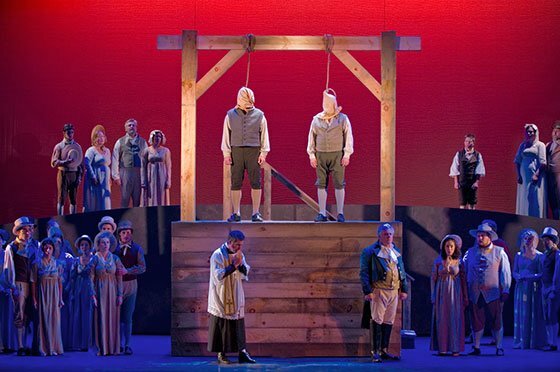 In the final scene, a double gallows is lowered in similar manner, so it appears on a platform above the chorus/mob and the condemned and Cheverus can climb up onto it. Furniture and props were readily moved by cast members during orchestral interludes, and the action flowed from scene to scene. The cell cots folded up against slatted backs, replicating the wing shapes and providing continuity of image. A brief ballet choreographed by Wendy Woodson, Amherst College professor of theater and dance, in Act 3 in a flashback featured some traditional Irish dance steps and created an effective calming interlude in the progress of the final hours. 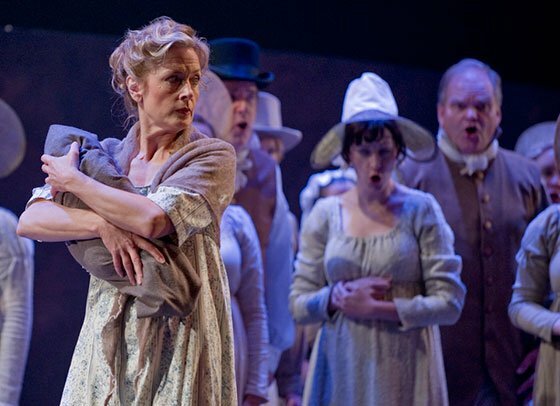 It was performed without a screen by soprano Kari Lyon, representing Bridie, the only woman for whom Halligan felt anything (he had impregnated and abandoned to flee to America), and Geoff Herrmann, a silent role, representing Halligan as a youth before his departure. Costumes suggestive of the period were designed by Smith College Costume Shop Manager Emily Dunn. The program book included a synopsis of the action, a chronology of the actual 1806 events including the pardon by Gov. Michael Dukakis in 1984, information about the sites, reproductions of portraits and places, and the clipping from the Daily Hampshire Gazette of June 11th of that year announcing the hanging. The 28-member instrumental ensemble was drawn heavily from the personnel of the Springfield Symphony Orchestra with its music director and conductor, Kevin Rhodes, wielding the baton. While clearly of particular local interest, the story has wider, even international resonance. It is a compelling opera, and the production was outstanding and the performances convincing. It was repeated on Sunday September 22nd.